These days, we're used to pharmaceutical advertising featuring pastel shades, dulcet tones, and 10 paragraphs of fine print. 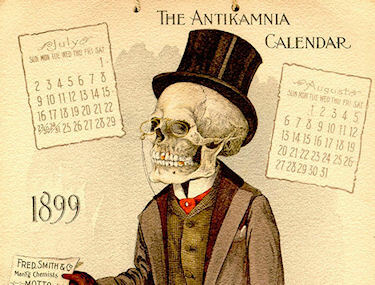 But at the end of the 1800s, one St. Louis company marketed their signature pain-relieving product with a series of macabre calendars featuring skeletons at work and play. Ironically, the very product they were advertising would later be shown to be fatal.